Feline naughty? Slink your way into this glossy black catmask with ears to instantly transform your look and give a whole new meaning to 'cougar fetish'. With permanently pricked ears and extra large eyes, it's purr-fect for all sorts of role play fun. Order over the phone: Call 0044 1225 303 840 and quote code 61247. Going to a fancy dress party and want to snag your own Bruce Wayne? Or perhaps you've heard about kitten play and want to introduce cat and mouse games to your relationship? Whatever floats your boat, this mask is up to the task and sure to amp your inner cat-titude to fur-raising levels and we're paw-sitive your other half will reckon you're the cats whiskers from meow until forever. It's party time: p-a-r-t---y? Because I gotta! You must know the film 'The Mask' When Stanley Ipkiss first puts it on. He whizzes around the room. Well that was me after I applied some silicone lube to give it that nice shine. It comes in a bag. As soon as I took it out I wanted to try it on. I added the silicone lube. First impressions were it looks good but it had a lot of wrinkles. I now know it was due to it being a bit cold once. You have it on for about 5 minutes and the latex warms up and you can adjust it so the wrinkles go out by just pulling it down. It did feel delicate as I was adjusting it. Later on I put on the silicone lube and put on the mask. This time it felt stronger, not as delicate. As I was adjusting the mask it was feeling more of a snug fit it, felt tighter like it was fitting my head, or to put it better, it felt a part of me. Once you have it looking right then it stays, no shifting needed through out the night. I think adding the silicone lube makes it stronger. 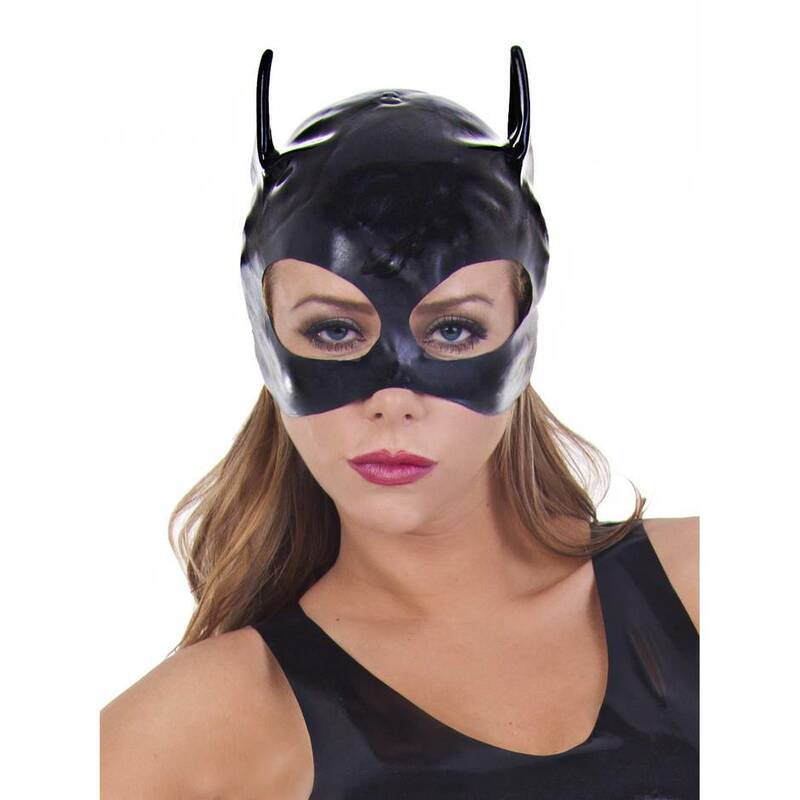 This is just for bedroom/home fun, but if I had a full on catsuit I would be proud to go to town wearing this mask. Saying that, I did go out by myself late at night with the mask on. It was fun but no one was around. As I'm a guy I was a bit worried it would look a bit too feminine, but it doesn't, you can pass it off as a Batman mask or a Catwoman because of the ears, they are longer. I have taken it off and on loads and the ears stay up no chance of the ears bending. Only one minus point, which I think is just my own preference not a flaw in the mask, the eyes cutout, I would have preferred if they were a bit smaller. The cutout is rather large. Maybe this helps it to be a Catwoman or a Batman mask. After adding the silicone it shines right up and makes me feel very happy to wear it. It's a thin mask even though its thin it feels strong. After adding silicone lube it doesn't feel like a cheap mask and I don't think you will have to worry about it ripping. I imagine this mask will last a long time. A very good buy. After I had worn it I gave it a wash, which was just putting in a bowel of warm water with some soap. It soon dried off, but don't make the mistake I did and not have any talc . Being a newbie to latex I didn't know that you put the talc on once it's dried to stop the mask from sticking to itself. 1) Make sure you have some silicone lube or similar to shine it up. 2) Make sure you have some talc when storing it away. How it shines and how the ears stand up, plus it fits so nice. It's fun to wear, looks amazing, and you will want to be a superhero. This mask is ideal for costumes for parties, conventions, bedrooms, dungeons et cetera. If you want the shiniest option for costuming, latex is the way to go. Once shined and lubed up you can brighten the darkest dungeon. A useful benefit of this mask comes from the design itself. With it being a half-mask it gives the skin lots of space to breath as opposed to a full head mask which would not. The benefit of this comes often to those new to wearing the material as diving in at the deep end and wearing something fully enclosing that can be a little overwhelming for those new to the material. Great for wearing at many occasions. I love this mask! I think it is quite possibly one of the best Catwoman masks I've laid eyes on, and I couldn't contain my excitement when it arrived on my desk for working on. As soon as I took it out of its bag I couldn't resist putting it straight on and seeing if it looked as good on as I hoped. The good news is it does! I will say that it can be a little fiddly to get on "just right", but once you've faffed and adjusted it in all the right places it's perfect. I have short hair, which I think made getting the mask on a little easier, so if you have long hair I'd recommend pulling your hair into a low ponytail to get it on to begin with. The mask itself sits over the top half of your face (as you can see in the photos) and covers your ears, which could be good for anyone who wants to wear this in the bedroom for sensory deprivation play. The most fiddly bit to get right is the band which goes over your cheeks and nose. To get the eye holes to sit correctly you need to tug the latex down a little, and if you tug too far it springs back a little, giving you an upturned piggy nose (NOT something Catwoman would approve of, I'm sure!). Once you've managed to get that sorted, though, it's spot on. I'd recommend slipping this hood on after applying any makeup and letting it sit on your head without fiddling for around 10 minutes to warm the rubber. As it warms it will become less tight and be much easier to shift about into the best position. Be prepared to touch up your makeup after you've done this as it can get a little sweaty. Don't let this put you off, though - it really wasn't a bother at all. It's not like you're pouring with sweat - just a little... moist! If you want to make things even easier, dust your forehead (and if you can stand it, hair) with some talc before putting it on. Once you've got your mask on where you want it, it really is a superb Catwoman replica. The ears sit just perfectly, and the eye holes are just the right size and shape. Pair it with a catsuit and bullwhip and you've got yourself a prize winning Anti-Hero costume! This is a great beginners latex item if you're delving into fetishwear for the first time, and is also ideal for anyone into cosplay, roleplay or just fancy dress in general. It was a little fiddly to get "perfect" but that's it. The best Catwoman mask I've ever seen.